Location: There are numerous small but interesting islands located off the Atlantic coast of Brazil. 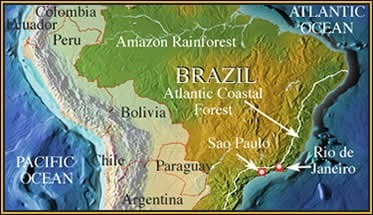 The tiny island of Queimada Grande has been isolated from the mainland of S.America for upwards of 100,000 years. Across rough seas, it is a difficult and dangerous place to visit, not just because of the ocean, but because it is home to probably the most venomous snake in S.America, up to 5,000 of them! The golden lancehead is endemic to Queimada Grande and because there are no mammals on the island, it is forced to feed on birds. For reasons that will become apparent in the film, this means it must possess a more toxic venom than its mainland mammal-eating relatives, between 3x and 5x more toxic. Mark links up with the Brazilian team studying the golden lanchead, led by Prof Marcio Martins from Sao Paulo University and Francisco Luis Franco from the world famous Butantan Institute in Sao Paulo and they also visit the nearby island of Alcatrazes which is inhabited by giant tarantula spiders, huge tegu lizards and an undescribed species of pitviper. Marcio also has a radio-tracking project to study the behaviour of caiçacas, a semi-aquatic pitviper, and Mark joins him to track down his study animals. 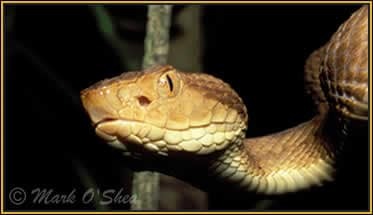 A close view of the head of the Golden lancehead (Bothrops insularis), note the forward-facing heat-sensitive pits.